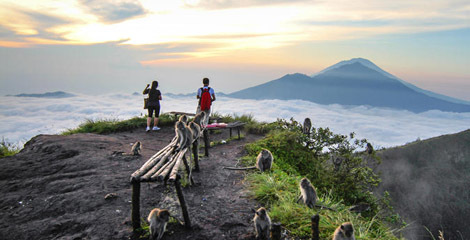 Bali tours adventures consist of nature adventures concept. Some of nature adventures concept are eco cycling tour, mount trekking, forest trekking and rice field trekking tours, water rafting tour, jeep safari tour, and quad/atv tour. •	Nusa dua 1.45 – 2.00 am. •	jimbaran, 01.45 – 02.00 am. •	Kuta at o2 – 2.15 am. •	Ubud at 02.30 – 03 am. And will have extra charge if pick up beyond of these areas. Boat Transfer from Bali to Gili Trawangan.